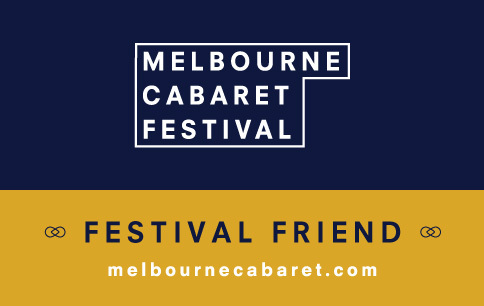 Being a ‘Festival Friend’ of the not-for-profit Melbourne Cabaret Festival means you’re part of the team. Our success is your success as we can’t deliver one of Melbourne’s key winter arts events without you. Let us tempt you to join us as a Festival Friend and indulge in two weeks of atmospheric, seductive and soul-stirring entertainment. Exclusive discounts to every show across the festival, including more than $20 off the Opening Gala alone. Wait for us to send you a ‘promo’ code before purchasing tickets. The satisfaction that comes from supporting a not-for-profit organisation that works tirelessly to present quality cabaret performances. Become a support for $45 inc GST, or demonstrate your passion by selecting the $60 option. To make your payment, please EFT the correct amount to the following account. Email us the following information so we can verify your payment and communicate effectively with you. Wait for us to send you a ‘promo’ code before purchasing tickets. Choose Passionate or Supporter level and pay securely using a credit card. A Festival Friend card is mailed to you soon after payment is confirmed. You need to show this card when collecting tickets to claim discounts. Your Festival card is for you only and is not transferable.